Background and Objectives: Rituximab, given in four weekly doses, is a promising treatment for idiopathic membranous nephropathy and other immune-mediated diseases and lymphoproliferative disorders. This multidose regimen, however, may cause hypersensitivity reactions and is extremely expensive. This study was aimed at evaluating whether titrating rituximab to circulating CD20 B cells may improve safety and limit costs of treatment. Design, Setting, Participants, & Measurements: In a matched-cohort, single-center, controlled study, the outcome of 12 new incident patients who had idiopathic membranous nephropathy and nephrotic syndrome and received a B cell–driven treatment was compared with that of 24 historical reference patients who were given the standard protocol of four weekly doses of 375 mg/m2. Results: Only one patient needed a second dose to achieve full CD20 cell depletion. At 1 yr, time course of the components of nephrotic syndrome and the proportion of patients who achieved disease remission (25%) was identical in both groups. 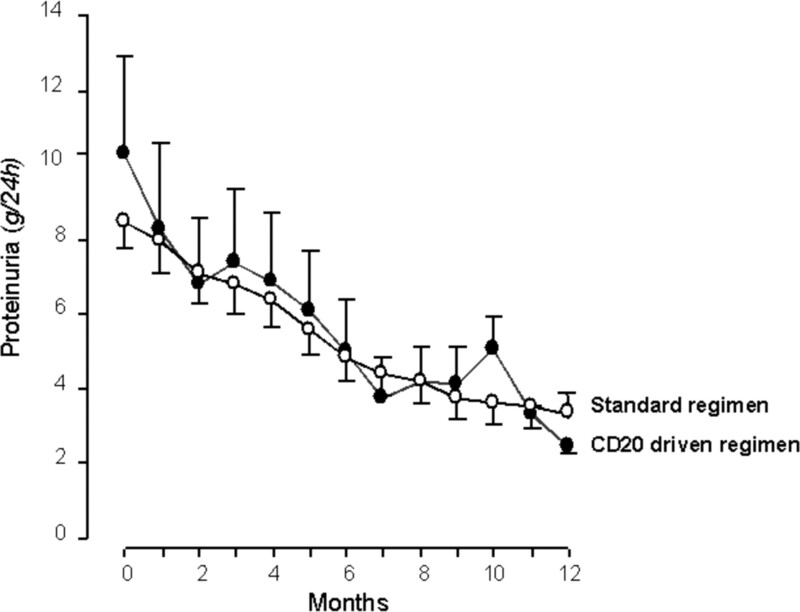 Persistent CD20 cell depletion was achieved in all patients. Costs for rituximab treatment and hospitalizations totalled €3770.90 ($4902.20) and €13,977.60 ($18,170.80) with the B cell–driven and the four-dose protocol, respectively. One patient on standard protocol had a severe adverse reaction at second rituximab dose. Thus, B cell titrated as effectively as standard rituximab treatment achieves B cell depletion and idiopathic membranous nephropathy remission but is fourfold less expensive, allowing for more than €10,000, approximately $13,000 in savings per patient. Conclusions: Avoiding unnecessary reexposure to rituximab is extremely cost-saving and may limit the production of antichimeric antibodies that may increase the risk for adverse reactions and prevent re-treatment of disease recurrences. Rituximab is an engineered chimeric mAb against CD20 antigen, a transmembrane protein found on mature, immature, and malignant B cells (1,2). After treatment with rituximab, B cells are prevented from proliferating and undergo apoptosis and lysis (1), an effect that seems to be dose dependent (2). The dosing protocol approved for B cell malignancies is of four weekly doses of 375 mg/m2, a regimen that achieves persistent B cell depletion for 6 to 9 mo in >80% of patients (3). This protocol has been used also to inhibit B cell clones in patients with antibody-mediated diseases such as idiopathic membranous nephropathy (IMN), cryoglobulinemia, rheumatoid arthritis, vascular rejection, and others (4). However, in 29 consecutive patients who were given four weekly doses of 375 mg/m2 to treat IMN and persistent nephrotic syndrome, we observed a full B cell depletion already after the first rituximab administration (5,6). This finding suggested that a single rituximab administration might be sufficient to inhibit fully aberrant B cell clones that produce pathogenic autoantibodies. To test this hypothesis, we designed a treatment protocol titrated to circulating B cells and, in the setting of a prospective matched-cohort study (7), compared the outcome of new incident patients who had IMN and received this novel regimen with that of historical reference patients who were given the standard protocol. Since April 2001, we elected for rituximab treatment all patients with biopsy-proven IMN, creatinine clearance >20 ml/min per 1.73 m2, persistent urinary protein excretion rate ≥3.5 g/24 h for at least 6 mo of angiotensin-converting enzyme inhibitor therapy (ramipril 5 to 10 mg/d), no previous remissions or treatment with steroids or immunosuppressive drugs during the past year, and no circulating hepatitis B surface antigens or anti–hepatitis B core antibodies. Since November 2005, however, we replaced the standard protocol of four weekly doses of 375 mg/m2 with a novel protocol titrated to circulating B cells. In this matched-cohort study, we compared the outcome of each patient who was given the B cell–driven protocol with that of two reference patients who were matched by age (±5 yr), gender, and proteinuria (±1 g/24 h) from the cohort of patients who were given the standard protocol. All patients gave written informed consent according to the Declaration of Helsinki. The study protocol was approved by the Ethical Committee of the Clinical Research Center for Rare Diseases “Aldo & Cele Daccò,” Villa Camozzi, of the Mario Negri Institute for Pharmacologic Research. This was a fully academic, internally funded study without involvement of pharmaceutical companies. Patients were hospitalized the evening before and were discharged the day after each rituximab administration. At admission, 24-h urinary protein excretion (mean of three consecutive measurements), circulating CD20 and CD19 B cells (counted by fluorescence-assisted cell-sorter analysis), and relevant clinical and laboratory parameters (including the tubular-interstitial score  at pretreatment biopsies) were recorded. After premedication with 10 mg of chlorphenamine and 500 mg of hydrocortisone, 375 mg/m2 rituximab reconstituted in saline to a concentration of 1 mg/ml was infused at an initial rate of 50 ml/h, progressively increased according to tolerability. An intensivist was alerted in the case of adverse events during the infusion. Baseline parameters were then evaluated weekly for 4 wk and every month up to 1 yr. When ≥5 B cells/mm3 were detected in the circulation after the first administration, patients who were allocated to the B cell–driven protocol received a second infusion. Reference patients who were allocated to the standard protocol received three additional weekly infusions regardless of B cell counts. All patients were advised to have low sodium and controlled protein intake and received symptomatic treatment to control edema, hypertension, and dyslipidemia. Treatment targets were the same with the two regimens (8). Cost analysis took the perspective of healthy services providers, and the costing method determined the direct health care costs associated with each treatment schedule. All resource use was valued at 2006 Euro prices. Rituximab costs were estimated on the basis of price and amount infused. Costs for hospitalization were obtained from the Hospital Economy Department. Indirect costs were not considered. Main outcome variable was 24-h urinary protein excretion considered as a continuous variable. Categorical outcomes included complete (24-h proteinuria reduction to <0.3 g in at least two consecutive evaluations and stable or decreasing serum creatinine) or partial (24-h proteinuria reduction to <3 g combined with a reduction of >50% versus baseline in at least two consecutive evaluations and stable or decreasing serum creatinine) remission, respectively, or no response (24-h proteinuria ≥3.5 g throughout the whole study period and/or increasing serum creatinine). The t test was used for comparisons between continuous variables, and χ2 and Fisher exact tests were used for comparisons between categorical variables. Association between variables was measured by means of Pearson correlation coefficient. All statistical tests were two-sided. P < 0.05 was considered statistically significant. Data were expressed as means ± SD or median ± SE as appropriate. Twelve patients and 24 reference patients received B cell–driven and standard four-dose protocol, respectively. Their baseline characteristics were similar (Tables 1 and 2). Eleven of the 12 patients who were given the B cell–driven protocol received a single infusion. One patient received a second infusion because 1 wk after treatment he still had 9 circulating B cells/mm3. All patients who were given the standard protocol received four infusions. On average, patients and reference patients weighed 76.0 ± 11.6 and 78.6 ± 13.7 kg and received a cumulative dosage of 750.8 ± 150.8 and 2786.7 ± 206.2 mg, respectively. Proteinuria progressively and similarly decreased in both groups (Figure 1) in parallel with similar serum albumin increases and serum cholesterol reductions (Table 1). Average proteinuria reduction on follow-up versus baseline tended to correlate with tubulointerstitial score, but the correlation failed to reach statistical significance (P = 0.10). On follow-up, a similar proportion of patients and reference patients achieved complete (n = 2 [17%] versus 2 [8%]) or partial (n = 6 [50%] versus 14 [58%]) remission. The proportion of nonresponders (n = 4 [33%] versus 8 [33%]) was the same in the two groups. Serum creatinine was stable and BP was similar in the two groups throughout the study period (Table 1). B cells decreased to undetectable numbers by week 1 and remained below normal ranges up to study end in both groups (Figure 2). CD19 B cells followed an identical trend (data not shown). The 24-hour urinary protein excretion rate at baseline (month 0) and at different time points up to 12 mo of follow-up in patients who were allocated to B cell–titrated rituximab treatment or to the standard four-weekly dose protocol. CD20 B cell count at baseline (month 0) and at different time points up to 12 mo of follow-up in patients who were allocated to B cell–titrated rituximab treatment or to the standard four-weekly dose protocol. One patient who had a severe reaction of nausea, vomiting, sweating, and hypotension and recovered with temporary treatment interruption, plasma expanders, and 500 mg of intravenous hydrocortisone occurred in the standard protocol group and, despite antihistamine and steroid premedication, experienced a recurrence (with less severe symptoms) during the second infusion. One and four patients in the B cell–driven and standard protocol groups, respectively, had mild adverse reactions (nausea, chills, sweating, and face rush) during the first infusion and recovered with transient treatment withdrawal and did not experience recurrence after treatment reexposure. In one of the four patients of the standard protocol group, the disease recurred 18 mo after the first course of rituximab. A second course was planned, but, a few minutes after the start of the first infusion, treatment had to be stopped because of a systemic rash that resolved only with high-dosage intravenous steroids and antihistamines. On patient request, a second infusion was attempted after 1 wk of premedication with oral steroids and antihistamines, but, again, it had to be stopped after a few minutes because of a systemic rash. Subsequent analyses revealed that the patient had developed antichimeric antibodies. Overall, patients and reference patients received 13 and 96 infusions, equivalent to a cumulative individual dosage of 9.7 and 36.1 mg/kg, respectively. Considering a cost of €4.13 (equivalent to $5.37) per milligram of rituximab, the individual treatment cost for a patient of 77.6 kg (the average weight of patients included in both cohorts considered as a whole) was of €3108.70 ($4041.30) or €11,569.60 ($15,040.50) with the B cell–driven or standard protocol, respectively. On average, patients and reference patients were hospitalized for 2.2 and 8.0 d, respectively. Considering a daily hospitalization cost of €301.00 ($391.30), the individual cost was €662.20 ($860.90) and €2408.00 ($3130.40) for patients and reference patients, respectively. Overall, the individual treatment cost was €3770.90 ($4902.20) with the B cell–driven protocol and €13,977.60 ($18,170.80) with the standard treatment. Thus, B cell–driven compared with standard rituximab treatment saved €10,206.70 ($13,268.70) per patient. Current therapeutic approaches to IMN, the most common cause of nephrotic syndrome in adults in many countries, still rely on steroids and immunosuppressive drugs, which are not specific and carry the risk for severe toxic effects. Advances in the understanding of pathogenic mechanisms of disease in IMN, however, allowed identification of more specific approaches with a better risk/benefit profile. Data from studies in animals suggest that the typical deposits of IgG, often IgG4, on the subepithelial layer of the glomerular capillary wall are caused by B cell–mediated reactions, which promote injury to the glomerular filtering barrier and result in proteinuria (9). Thus, although IMN autoantigens remain elusive and the role of B cells has not been fully explained in humans, agents that specifically interfere with B cells would ideally represent the first step toward selective therapy in humans. Finding that four weekly administrations of rituximab, a mAb against the cell surface antigen CD20 of B cells, significantly and persistently reduced proteinuria in eight patients with IMN and long-lasting nephrotic syndrome, reinforced this possibility (5). Three patients, however, had hypersensitivity reactions of the immediate type that in two cases resolved only after steroid infusion. Moreover, this treatment regimen was extremely expensive, with costs averaging €14,000 (approximately $18,000) per patient. Therefore, we explored whether avoiding repeated drug exposure allowed limitation of adverse effects and costs of rituximab therapy without affecting the efficacy of treatment. Indeed, in this prospective, matched-cohort study, we found that lymphocytolytic rituximab treatment titrated to circulating B cells was as effective as the standard four-dose protocol in inducing IMN remission but showed a better risk/benefit profile, required fewer hospitalizations, and was four-fold less expensive, allowing for more than €10,000 (approximately $13,000) in savings per patient. In the two treatment groups, proteinuria decreased, serum albumin increased, and cholesterol decreased to a similar extent at each time point, and the same proportion of patients achieved complete or partial disease remission. Notably, circulating CD20 B cells were fully depleted already after the first rituximab administration and remained below normal range throughout the whole observation period in both groups. Flow cytometry counts of B cells that carry the CD19 marker—another surface antigen that identifies plasma cell precursors (4)—showed an identical trend. This confirmed that failure to detect CD20+ cells was not due to CD20 antigen masking upon rituximab binding to its specific receptor but rather reflected a true and persistent B cell depletion from the circulation. These data converge to indicate that in the large majority of cases, three repeated rituximab doses after an initial infusion of 375 mg for m2 body surface area do not provide additional benefit. At most, in a very small minority of cases, a second course may be indicated when full B cell depletion is not achieved by the first dose. One patient on standard therapy had a severe reaction that, despite steroid and antihistamine premedication, recurred, although with less severe symptoms, during the second infusion despite steroid and antihistamine premedication. One additional patient who received the four-dose course of rituximab had a systemic rash as soon as a second course was attempted to cure a recurrence of the disease. The rash recurred even when rituximab was infused after 1 wk of steroid and antihistamine premedication, and this definitely prevented the execution of treatment. Subsequent analyses revealed that the patient had developed anti-rituximab antibodies. Indeed, repeated or prolonged exposure to rituximab may induce the production of antichimeric antibodies (10,11), which may limit the effect of treatment and increase the risk for hypersensitivity reactions of the immediate type upon drug reexposure. This may prevent re-treatment in those who, after an initial response to therapy, may require a second rituximab course because of disease recurrence. Thus, avoiding unnecessary infusions during the initial course of rituximab may have important clinical implications. Available studies that evaluated the effect of rituximab in autoimmune diseases are too short and small to assess late and rare complications such as malignancies and opportunistic infections (4,12,13). Moreover, data may be confounded by concomitant immunosuppressive therapy. However, fatal hepatitis B virus reactivation has been reported after rituximab monotherapy with the standard four-dose protocol (14,15), and studies with other lymphocytolytic drugs such as Orthoclone OKT3 (16) and thymoglobulins (8) showed a positive correlation between cumulative drug exposure and risk. Therefore, minimizing exposure to rituximab by titrating treatment to circulating B cells might also improve the safety profile of lymphocytolytic therapy. An intriguing finding of our study, as well as of previous studies of rituximab in IMN (5,6,17), is that the decrease in proteinuria was already apparent at 3 mo after drug administration. A possible explanation is that in patients with active IMN disease, there is a balance between the production of autoantibodies by activated plasma cells and their continuous clearance from the circulation via ultrafiltration through the abnormally permeant glomerular barrier and concomitant consumption in the kidney at the site where they interact with their specific antigen(s) to form immunocomplexes. This balance is broken after rituximab administration induces a full depletion of the plasma cell precursors. Indeed, chronically activated plasma cells have a faster turnover than quiescent plasma cells and a shorter half-life (17). Thus, their number should start to decline shortly after rituximab treatment, and this should translate into a parallel reduction in antibody production. The new synthesis of autoantibodies is progressively exhausted, the cleared antibodies are not fully replaced any longer, and pathogenic antibodies may progressively disappear from the circulation. This may explain why urinary proteins start to decrease already in the first months after rituximab administration and then progressively decrease over time, in a process that may continue for up to 1 yr (18). Despite substantial and progressive reduction versus pretreatment levels and regardless of treatment group, residual 24-h proteinuria persistently exceeded 3.5 g in one third of patients who, therefore, remained at increased risk for disease progression and for complications of the nephrotic syndrome (19). We previously found that these patients tend to have more severe chronic, in particular tubulointerstitial, changes at biopsy evaluation and may benefit from dual renin-angiotensin system blockade by combined therapy with angiotensin-converting enzyme inhibitors and angiotensin II blockers (6). The lack of statistical significance in the correlation between proteinuria reduction on follow-up versus baseline and tubulointerstitial score in this study may reflect the relatively small sample size and the spontaneous fluctuations in proteinuria that reduced the power of the analyses. A strength of our study is that patients were closely monitored with predefined evaluations and that at each time point, proteinuria—the primary efficacy variable—was measured in three consecutive urinary collections and the mean value was considered for statistical analyses. Moreover, we evaluated whether the urine was properly collected by measuring 24-h urinary creatinine excretion and discarded samples with urinary excretions outside the physiologic range. This limited the confounding effect of random fluctuations or of erroneous measurements of proteinuria, which increased the power of the analyses and the reliability of the findings despite the relatively small sample size. On the same line, that all patients were aware of the severity of their disease and showed a remarkably good compliance even before rituximab administration suggests that it is very unlikely that the study findings were confounded by an increased adherence to treatment and diet recommendations. Thus, evidence of benefit provided by this and previous studies of the effects of rituximab in IMN (5,6,18) may provide the background for designing an adequately powered, randomized clinical trial to assess definitively the risk/benefit profile of rituximab as compared with other medications, such as steroids, alkylating agents, and calcineurin inhibitors, that have been extensively used in the past in this clinical setting (20,21). On this regard, finding that at 1 yr of follow-up the reduction in proteinuria versus baseline observed in our study (60%) was comparable to that previously reported in patients who were treated with methylprednisolone and chlorambucil (20) or cyclophosphamide (21) can be taken to suggest that, at least in the short term, rituximab is as effective as aspecific immunosuppressants such as steroids and alkylating agents and, considering its remarkably good risk profile, might offer the advantage of a lower toxicity. B cell–driven rituximab treatment is as effective as standard four-dose therapy in achieving remission of IMN but is remarkably less time- and cost-consuming and may have a better safety profile. Whether this may apply also to other indications to B cell–depleting therapy is worth investigating. We are grateful to Sergio Brescianini, Simona Gamba, Li Hui Huang, Mariana Rasheva Kotlarova, Svitlana Yakymchuk, Manuela Vergani, Emilia Camoni, Elena Carozzi, Anna Ferrari, Franca Gamba, Simona Pavia, and all of the nurses of the Unit of Nephrology for patient care and monitoring; to Dr. Flavio Gaspari and Dr. Mario Bontempelli for supervision of the laboratory measurements; to Dr. Alessandro Bonomi for patient assistance during rituximab infusion; and to Franco Marchetti for preparation of the histology material. Manuela Passera helped to prepare the manuscript. P.C. and P.R. contributed equally to this work. Ponticelli C, Altieri P, Scolari F, Passerini P, Roccatello D, Cesana B, Melis P, Valzorio B, Sasdelli M, Pasquali S, Pozzi C, Piccoli G, Lupo A, Segagni S, Antonucci F, Dugo M, Minari M, Scalia A, Pedrini L, Pisano G, Grassi C, Farina M, Bellazzi R: A randomized study comparing methylprednisolone plus chlorambucil versus methylprednisolone plus cyclophosphamide in idiopathic membranous nephropathy. J Am Soc Nephrol9 :444– 450,1998 See the related article, “Calciotropic Hormones and Arterial Physiology: D-lightful Insights,” on pages 369–373.